Spaghetti squash has become a staple in our house. Even the kids eat it now. I mean, most of the time they don’t realize that’s what they’re eating but hey, it works, right?? There are some gluten-free pasta options, but I prefer to use spaghetti squash when possible because it contains more nutrients than any gluten-free pasta. This recipe would fall more under the Primal category if you choose to eat very strict Paleo because it does include dairy in the form of mozzarella cheese. Another winning recipe for this winter! If you’re cooking for a large group you can fix this in a regular 9×13 baking dish. 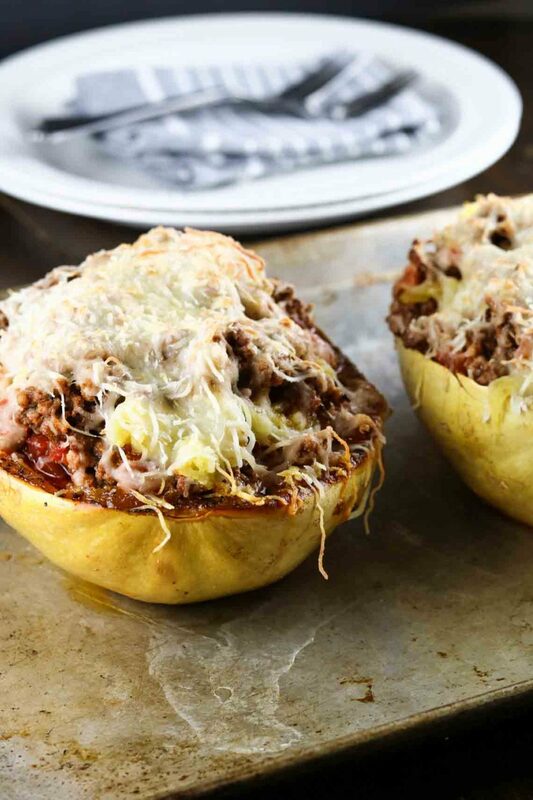 If you’re cooking just for two, go ahead and leave it in the shell of the spaghetti squash. I like the hint of Italian sausage in this recipe. I’m not a huge sausage fan, but mixing 1/2 Italian sausage with 1/2 grass fed beef gives it a nice flavor without being overwhelming on the sausage side. I did use a jar of organic pasta sauce for this recipe. Check out the labels and look for organic, non-GMO and very little sugar. Oh, and only ingredients you can pronounce. This is the perfect cold weather comfort dish! Slice the spaghetti squash lengthwise, scrape out the seeds. Brush inside of both sides with olive oil and sprinkle with 1/2 tsp. salt and pepper. Turn face down onto a baking sheet and bake for 45 minutes. While squash is baking, cook Italian sausage, beef and remaining seasonings in a skillet until cooked through. Drain any excess grease and return to the pan. Add in pasta sauce and let simmer on low. 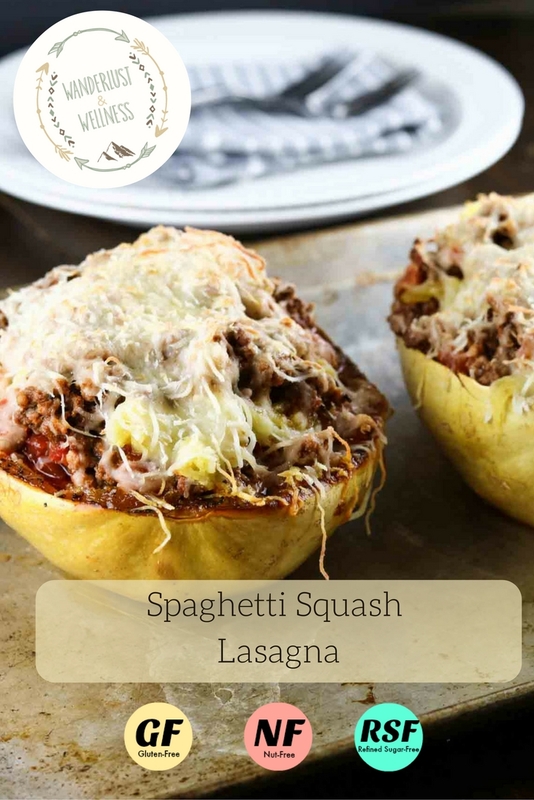 Once finished cooking, remove spaghetti squash from oven, carefully turn over (they will be hot) and scrape out the spaghetti squash and place into a large mixing bowl. 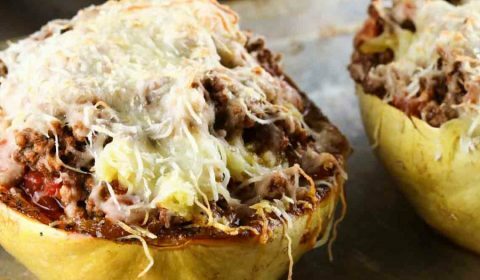 Begin layering the ingredients into the empty squash shells starting with a layer of spaghetti squash, then meat & sauce mixture, then mozzarella cheese. 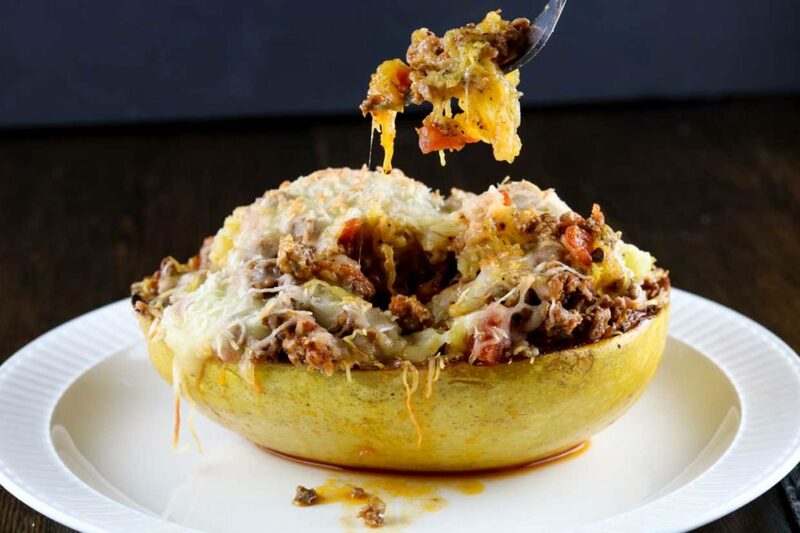 Continue with another layer of spaghetti squash, meat & sauce mixture, then top with mozzarella cheese. Place back into the oven just long enough to melt the cheese on top.